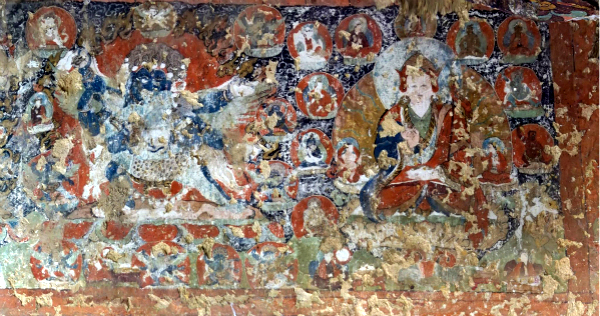 Discovered among ruins of a temple in Shannan City, Tibet, vivid mural paintings astonished the archaeologists with well-preserved, clear images amongst Green Bodhisattva Tara, Samantabhadra, Avalokitesvara and other Buddhas. It is an archaeological exploration launched by a joint team consistent with experts from Hunan Cultural Relic Research Institute and Shannan Cultural Heritage Bureau. The specific site is in a valley about 10km south to Longzi County administrated by Shannan. The paintings were determined to be created 800 years earlier from now. The ruined temple has been named as "Golhakhang", with "Go" from the sound of the location and "Lhakhang" meaning Buddhist temple. Although the new-finding temple is extremely small in size with a total height of 11.1m and all site is about 400m², it is an exciting discovery for Shannan indeed since mural paintings previously had been found in the city were mostly dated after the 17th century, while the new findings were estimated from 400 years earlier. Changpa Tsering, director of the Shannan Cultural Heritage Bureau, said mural paintings of 13th-15th centuries had been rarely found in Tibet. The Golhakhang Temple has a stupa erected in the center of it, which connects the surrounding buildings. The exact time of the temple has not been determined, however, Chai Huanbo from Hunan Cultural Relic Research Institute said that according to the structure, Golhakhang Temple and its surrounding buildings were originally designed like this. This type of building design had long disappeared and has not been found in other Tibetan temples. 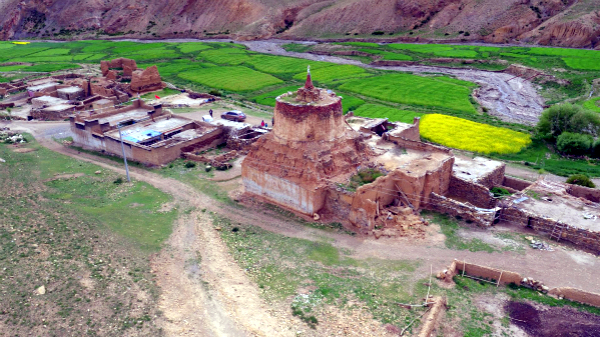 Shannan area is generally acknowledged as a sacred place and the cradle-land for the ethnic Tibetan culture by archaeologists around the world.